This continuing education course explores how the body absorbs and metabolizes vitamin D, discusses its functions in the human body, explains how to evaluate appropriate blood levels based on the latest research, and identifies sources of the nutrient. Vitamin D comes in two major forms: vitamin D2 (ergocalciferol) and vitamin D3 (cholecalciferol). Primarily, vitamin D2 is manufactured and used to fortify foods, while vitamin D3 is synthesized in the skin and naturally available in some animal-based foods. Commercially manufactured supplements contain either form.3 Because these two forms have identical metabolism and function, the term “vitamin D” is used to represent both vitamins D2 and D3 unless specified. When people ingest vitamin D from food sources, the intestine’s epithelial cells absorb the vitamin D and carry it via chylomicrons through the lymphatic system and into the circulatory system.5 From the chylomicrons, vitamin D may be transferred to the vitamin D–binding protein and released into the liver, or it may stay in the chylomicron where it will be taken up by the liver, which is the last stop for the chylomicron after circulating in the body.1 Once in the liver, dietary vitamin D follows the same activation path as that produced from UVB rays by being hydroxylated into 25(OH)D and then into 1alpha,25(OH)2D. • Multiple sclerosis, rheumatoid arthritis, Crohn’s disease, and type 1 diabetes: suppresses the autoimmune response. Beyond bone health, some experts suggest that a serum vitamin D level of more than 75 nmol/L is necessary to positively impact long-latency diseases.8 Specifically, at 80 nmol/L, vitamin D no longer is the limiting factor for calcium absorption from the intestine. At 90 to 100 nmol/L, lower extremity function, dental health, and blood pressure are optimized, while the risk of fall, fracture, cardiovascular disease, all-cause mortality, and colorectal cancer are reduced.5,11 In fact, falls weren’t reduced in people aged 65 and older when serum vitamin D levels were below 60 nmol/L.11 Obviously, these suggested levels are significantly higher than the levels currently recommended by the IOM. It’s worth noting that many options exist for measuring the amount of calcidiol in the blood: chemiluminescence immunoassay, radioimmunoassay, liquid chromatography, high-performance liquid chromatography, and liquid chromatography–tandem mass spectrometry. However, the various tests return different results. For example, in one study, the number of participants with normal calcidiol levels was 19.9% with chemiluminescence immunoassay and 31.7% with liquid chromatography–tandem mass spectrometry.8 Also, the testing reagents may respond differently to vitamin D2 metabolites than to those from vitamin D3. With all of the proven and possible effects, it’s clear that vitamin D is required for good health. 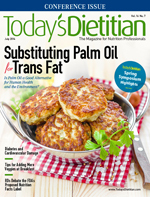 However, various factors can contribute to too low or too high vitamin D levels and should be taken into consideration when RDs counsel clients or patients on whether they should be tested. • CYP24A1: marked by increased serum vitamin D and calcium. Although hypovitaminosis D is more common, hypervitaminosis D can occur and primarily results in hypercalcemia and overcalcification of bone, soft tissues, the heart, blood vessels, and kidneys, as mentioned previously.7,8 Symptoms of hypervitaminosis D include anorexia, dry mouth, a metallic taste, nausea, vomiting, constipation, and diarrhea. With long-term oversupplementation, additional symptoms may include polydipsia, depression, headache, drowsiness, and weakness. Because the cost of testing can be high and many people seem to be deficient because of insufficient sun exposure and low dietary intake, most experts don’t recommend population testing for vitamin D status. In fact, the test results for most people are expected to indicate deficiency unless people recently have been exposed to the sun and/or are taking a vitamin D supplement. In 2011, the IOM published Dietary Reference Intakes for Calcium and Vitamin D to update the information provided in its 1997 report.3 With new data and the ability to integrate older data sets, the IOM established Adequate Intake levels for infants and Estimated Average Requirement and Recommended Dietary Allowance levels for children and adults (see Table 2). Note that 100 IU = 2.5 mcg. Because the amount of vitamin D the skin produces when exposed to UVB rays is influenced by many factors, the IOM is unable to recommend an amount of sun exposure that would ensure adequate vitamin D production for all people.3 As such, the Dietary Reference Intakes are limited to dietary intake and assume minimal sun exposure. In addition, the report indicates that the values are based on dose-response relationships for bone health only, as data are inconclusive regarding vitamin D’s effect on other health factors. As mentioned previously, many factors determine individuals’ vitamin D status based on their ability to absorb, metabolize, and utilize it. After assessing for conditions that may contribute to hypo- or hypervitaminosis D and the amount of sun exposure that will contribute to vitamin D synthesis, an individualized recommendation for dietary intake can be established using the Recommended Dietary Allowances as a guideline. As an example, people at 52˚N latitude get about one-half of the annual UVB rays as do people at 40˚N latitude.12 For people above 33˚N latitude and below 33˚S latitude, the angle of the sun is too low during the winter months to produce any vitamin D in the skin, regardless of duration of exposure.6 The smaller the zenith angle of the sun, the less vitamin D can be produced by the skin. Vitamin D is available in commercial supplements and some multivitamins or in pharmaceutical formulations. Physicians can prescribe a liquid supplement with 8,000 IU/mL for infants and younger children or a gelatin capsule with 50,000 IU for older children and adults. Vitamin D supplements are available with as little as 400 or as many as 50,000 IU per serving. In waiting for future research to clarify vitamin D’s role in the human body and the necessary intake to achieve the required levels, RDs should use the Recommended Dietary Allowance as the minimum intake that ensures their clients and patients can maintain bone health. Then, when individualizing the recommendation, RDs should consider lifestyle, environmental factors, malabsorption issues, medication use, genetic mutations, and other health conditions that can increase or decrease skin synthesis, metabolism, and usability of vitamin D.
— Stephanie Dunne is a graduate student in nutrition and a dietetic intern at Lehman College in the Bronx, New York. — Jenna A. Bell, PhD, RD, is senior vice president and director of food and wellness at Pollock Communications in New York City; the 2013-2014 chair of the Sports, Cardiovascular, and Wellness Nutrition Dietetic Practice Group; and a coauthor of Energy to Burn: The Ultimate Food & Nutrition Guide to Fuel Your Active Lifestyle. 1. Assess vitamin D’s life cycle in the body. 2. Evaluate vitamin D’s involvement in various aspects of health. 3. Determine recommended intakes of vitamin D.
4. Distinguish the sources of vitamin D.
2. Which of the following genetic mutations can result in normal levels of 25-hydroxyvitamin D [25(OH)D] and low levels of 1alpha,25(OH)2D? 7. 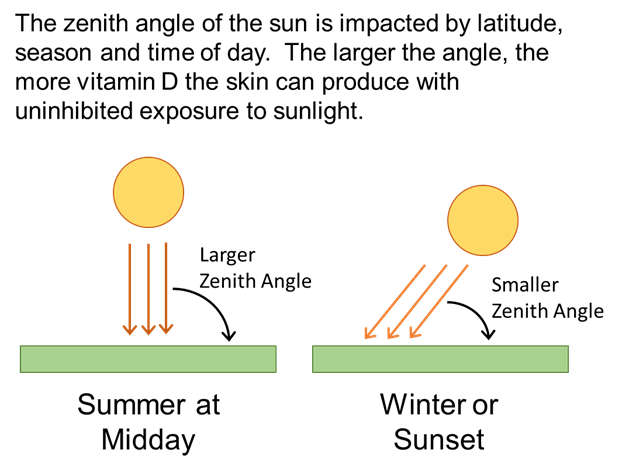 The sun is too low during the winter months to produce any vitamin D in the skin above and below which north/south parallel? 9. The Institute of Medicine identifies vitamin D deficiency as serum calcidiol levels below which of the following levels? 1. Jovicic S, Ignjatovic S, Majikic-Singh N. Biochemistry and metabolism of vitamin D. J Med Biochem. 2012;31(4):309-315. 2. Holick MF. The d-lightful vitamin D for health. J Med Biochem. 2013;32(1):1-10. 3. Ross AC, Taylor CL, Yaktine AL, Del Valle HB (eds). Dietary Reference Intakes for Calcium and Vitamin D. Washington, D.C.: National Academy Press; 2011. 4. Jaaskelainen T, Knekt P, Marniemi J, et al. Vitamin D status is associated with sociodemographic factors, lifestyle and metabolic health. Eur J Nutr. 2013;52(2):513-525. 5. Battault S, Whiting SJ, Peltier SL, Sadrin S, Gerber G, Maixent JM. Vitamin D metabolism, functions and needs: from science to health claims. Eur J Nutr. 2013;52(2):429-441. 6. Holick MF, Binkley NC, Bischoff-Ferrari HA, et al. Evaluation, treatment, and prevention of vitamin D deficiency: an Endocrine Society clinical practice guideline. J Clin Endocrinol Metab. 2011;96(7):1911-1930. 8. Kuhn T, Kaaks R, Teucher B, et al. Dietary, lifestyle, and genetic determinants of vitamin D status: a cross-sectional analysis from the European Prospective Investigation into Cancer and Nutrition (EPIC)-Germany study. Eur J Nutr. 2013;Epub ahead of print. 9. Vogeser M, Seger C. Vitamin D—challenges in diagnosing and monitoring of hypovitaminosis D. J Med Biochem. 2012;31(4):316-325. 10. Rosen CJ, Abrams SA, Aloia JF, et al. IOM committee members respond to Endocrine Society vitamin D guideline. J Clin Endocrinol Metab. 2012;97(4):1146-1152. 11. Bischoff-Ferrari HA, Shao A, Dawson-Hughes B, Hathcock J, Giovannucci E, Willett WC. Benefit–risk assessment of vitamin D supplementation. Osteoporos Int. 2010;21(7):1121-1132. 12. Godar DE, Pope SJ, Grant WB, Holick MF. Solar UV doses of adult Americans and vitamin D3 production. Dermatoendocrinol. 2011;3(4):243-350. 13. Moreno-Reyes R, Carpentier YA, Boelaert M, et al. Vitamin D deficiency and hyperparathyroidism in relation to ethnicity: a cross-sectional survey in healthy adults. Eur J Nutr. 2009;48(1):31-37. 14. Pronsky ZM, Crowe JP. Food-Medication Interactions. 17th ed. Birchrunville, PA: Food-Medication Interactions; 2012. 15. National Nutrient Database for Standard Reference Release 26. US Department of Agriculture website. http://ndb.nal.usda.gov/ndb/search/list. Accessed October 26, 2013.